Dharma Productions’ multi starrer bid budget Kalank is riding high on the promotional activities. From one city to another, one press conference to another, the stars are having a pretty jam-packed schedule. The period drama stars Alia Bhatt, Varun Dhawan, Sonakshi Sinha, Aditya Roy Kapoor, Madhuri Dixit and Sanjay Dutt in lead roles. 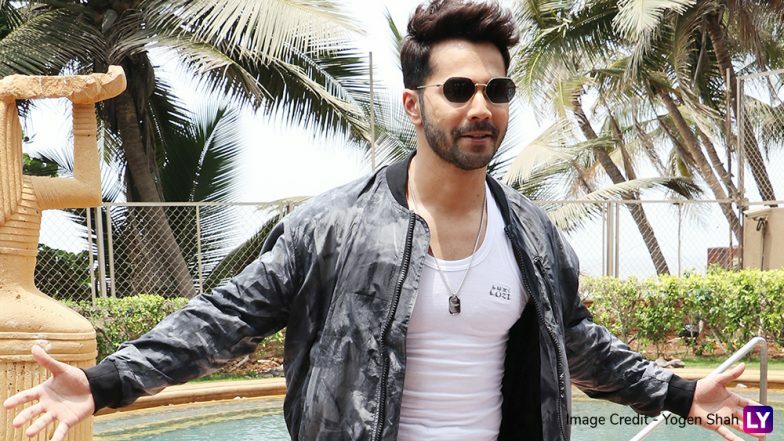 However, it seems that, when Bollywood’s very own powerhouse Varun is not promoting his film, he is busy looking dashing in a cool summer look. Kalank: Varun Dhawan-Alia Bhatt's Period Drama Censored With 12A Certificate by BBFC. Varun was recently spotted during the launch of Lux’s new products. The actor sported the Lux vest and clicked some dapper pictures. What caught our attention are the fun poses and absolute comfort with which the actor is getting the pictures. Varun took to his Instagram handle to share the commercial ad of the brand. He wrote, “Hai ek dum firstclass. Directed by ROHIT DHAWAN 🎥 @kamera002" Kalank Song Aira Gaira: Twitterati Call Out Karan Johar for Going Back on His Word to Never Use Item Numbers Again. On the work front, Varun is busy with the promotions of his most awaited film Kalank. The movie is all set to hit the big screens tomorrow. Apart from that, the actor is also shooting for Remo D’Souza’s upcoming dance film Street Dancer 3D, co-starring Shraddha Kapoor and Nora Fatehi.